Unbeaten American Deontay Wilder, (33-0, 32 KOs) defeated Bermane Stiverne, (24-2-1, 21 KOs) by a lopsided unanimous decision to win the WBC heavyweight title on Saturday night at the MGM Grand Garden Arena in Las Vegas. The 2008 Olympic bronze medallist was in total control for most of the fight, winning by scores of 120-107, 119-108 and 118-109. Wilder, 29, had stopped all of his previous 32 opponents inside 4 rounds and many was sure this fight would end in a knockout. It might not have ended in a knockout, but Wilder dominated his 36-year-old Canadian rival in almost every round. In doing so, becoming the first American world heavyweight champion since Shannon Briggs in 2007. Wilder connected with many of his powerful right hands throughout, but Stiverne had a good chin and took the shots well. The challenger capitalized on his reach advantage, keeping Stiverne on the end of his strong left jab. While Wilder jabbed and moved, Stiverne could only land one shot at a time, but even on the few occasions when Stiverne did land, Wilder's previously untested chin stood firm. Wilder was unable to knock Stiverne down but staggered him several times. Wilder appeared to stun Stiverne late in the second following a barrage of shots. As the bell sounded, Stiverne toppled forward and ended up tackling Wilder to the canvas. The champion looked more comfortable in the fourth round, closing the gap and landing with a solid left hook. Stiverne kept coming, and his punches started landing more often as the fight entered the middle rounds. 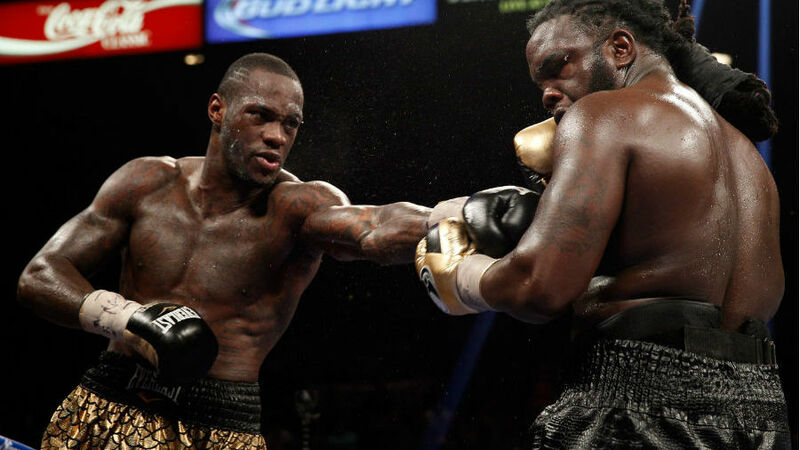 However, Wilder had a huge seventh round, landing several hard shots, but Stiverne somehow stayed on his feet. Both fighters tired towards the end of the bout, drawing some boos from the crowd but Wilder was still able to use his left jab to pile up points. Clearly in need of a knockout, Stiverne tried to press Wilder in the 12th round, but Wilder did his best to smother Stiverne's work and hang on for a decision win. "I'm just happy to bring this belt back to America, officially," said Wilder. "It's going to mean a lot. "I think I answered a lot of questions tonight. We knew we could go 12 rounds, We knew we could take a punch, we knew we could give it. All the hard work was done in camp. I had fun. I'm just excited. "I want to bring excitement to the heavyweight division. I want to fight four times a year. I'm ready whenever." "I wasn't myself," said Stiverne. "I felt 100 percent but I couldn't cut the ring off like I usually do. I was throwing hard punches but I could only throw two of them at a time. "I wasn't able to do what I wanted to do in the ring tonight. I don't want to take anything away from him. He fought a great fight but I was not ready." Also on the card, Mexico's Leo Santa Cruz (29-0-1, 17 KOs) stopped countryman Jesus Ruiz (32-5-5, 21 KOs) in the eighth round to successfully defend his WBC super bantamweight title. Santa Cruz trapped the challenger on the ropes and fired away with both hands before the referee stepped in to stop it.